Robert Schomburgk was the first to discover Roraima in 1838. He was a German and a geographer who was sent by the English Court (Royal Geographical Society). 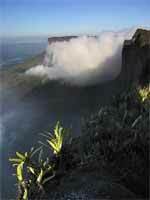 Sr. Everard Im Thurn and Harry Perkins were the first to reach Roraima peak plateau in 1884. Artur Conan Doyl, the world famous writer, was inspired by their lectures in London to write his famous novel The Lost World. A special tribe of racoon beasts is spread over the Central and South America. Coatis belong to this tribe. They are known for their long, movable nose that can be turned round by 45°. They are omnivorous animals that are very inteligent. Coatis are diurnal animals. Four kinds of coatis can be depicted. Nasua Marica (White-nosed Coati), Nasuella olivacea (Mountain Coati) and Nasua Nasua are the most known out of them. The kind we met at Roraima was probably Nasua nasua. The underground emergence not far from the entrance to the Crystal Eyes ponor. We enter a fantastic phreatic channel in vadose stadium of development at about 100 metres far from the entrance. The „Crystal Eyes“ – small holes about 2,5 m deep, filled with bright crystal pebbles, can be found on the rock bottom. Moving in the cave is quite easy and also the temperature of about 15°C is nice. We wore only a T-shirt under light tropical overalls. In spite of this we became lashed in sweat during longer stay in the cave. We supposed that these red-coloured speleothems that we found in the cave had been created with contribution of some microorganisms. However, the sample that Tomáš Charvát brought half of the year later showed that it was consisted of silicon oxides. Helpless miniature toad Oreophrynella quelchii on the finger of Lukáš is one of endemic species at Roraima-tepui and Kukenan-tepui. It has perfect mimicry. It is quite hard to see this toad on the wet black rock. The chasm of flying little devils juts out from the southern Roraima rock face. It can be seen out of the access path. The swampy frontier between Venezuela and Brasil. Roraima – the Walley of phalluses. Overhanging rocks at Roraima are called hotels. You can stay there overnight and hide there yourself from daily rain. Guacharo hotel is the most beautiful camp that the hiker can imagine. Eight tents can be put up there. In this hotel, there is enough covered space for camp life. This bivouac is seperated from the Roraima desert surface by the strip of exotic garden full of the Aechmeas, the Cycads, the Tillands and other endemic species . The hotel was called after rare birds nesting in the large cave walls of tropical parts in Latin America. It is said that they used to stay in the large entrance part of the cave that led from the hotel to the centre of Roraima. Several nests that we found there confirmed this. Sara – the name given to fanlike Stegolepis guianensis by the Pemon people. Its young outgrowths are edible and its taste reminds us of our leak. I tried to make a soup out of this plant for the participants of our expedition. Its consistence reminded us of thick liquid starch. We have never eaten it again. This red carnivorous plant is not always red. It can be more often found in green-yellow colour with dark red venation. The system of water surface regulation is interesting. The water surface serves as a trap for insect that is attracted by a lure placed above the amphora. The surplus water falls over a microscopic gap placed in the second third of the funnelled plant body. Roraima rose – the name given by the earl Maguire to this shrubby plant related with coffee. Vladimír Plešinger wrote about Orectant from Roraima that it looked like pineapple. I tested it because of this similarity. However, it was sharp and bitter. I realised that it reminded us of pineapple only by appearance. Guyanese analogy of our sundew. It can be found everywhere where water is found– even on the crystals of popular Roraima „The Crystal Walley“. This zoophagous plant catches its prey by several milimetres long sticky tentacles. In January 2003 a small Slovak-Czech speleological expedition acted in the Roraima table mountain (tepuy) in south-eastern Venezuela. In the number of five cavers we were succeeded in a detailed research of today’s the fourth longest world cave in quartzites, 2 410 m long Cueva Ojos de Cristal (Crystal Eyes Cave), which had been discovered and just informatively explored by two members of our expedition Marek Audy and Zoltán Ágh in February the 4th last year yet. The locality may be considered probably as the most developed classical quartzite cave in the world at present. The entrance into the Cueva Ojos de Cristal was discovered accidentally during an excursion at Roraima. The two above mentioned explorers had no speleological equipment at the moment in order to explore its tract deeply. They entered just 300 m deep into its bowels and they were often surprised by a dimensionality of its underground spaces. The cave continued freely along the waterflow and there were many branchings. So the decision was made: to try to find out its proportions and if perhaps there are also another, until now not known bigger caves under the Roraima surface. During the year of 2002, within our national federations – Slovak speleological society (SSS) and Czech speleological society (ČSS), we started to motivate people, prepare material and generate logistics for a light-type expedition without using a helicopter. At the same time we began to find out if there already had been any extensive speleological research in Roraima. We were surprised that none, although it is the most accessible one from among tepuys within the whole Gran Sabana region. Yet just a ponor with the shaft El Foso in the north of the meseta. Discovered by us, the Cueva Ojos de Cristal had surely never been visited by a man before, though it is situated exceedingly close to a path. We didn’t find the only human footstep neither in its delicate bottom sediments nor in a sand in its hardly accessible lateral corridors. For all that, just a bit further there is a bivouac (El Hotel Guácharos), which is often visited by tourists and there’s the another spacious cave in it. During the arrangements we had problems particularly with how to provide a transport of the whole material, especially provisions to Venezuela. Finally we chose an alternative of flight with Spanish Iberia airlines allowing to take up to 60 kg of luggage per person. The biggest problem were acetylene lamps and a carbide itself. There was an apprehension of having them condemned before flight. There were troubles with a weight of ropes alike (we took approximately 350 m in the end), in particular when before flight to Caracas several competent people deregistered themselves as regards their planned participation in the action. The problem consisted in an unclear situation in the country from where, immediately before departure, we got through media just negative reports on civil disorders, demonstrations and lack of fuel or fundamental provisions. It didn’t discourage us and therefore in January the 3rd in the number of five persons we took a flight from Vienna to Caracas (with intermediate landing in Madrid). Two participants joined us for a short time during their tourist excursion at Roraima with their friends in about the same time. List of participants of the expedition is as follows: M. Audy, B. Šmída, E. Kapucian, L. Vlček, M. Griflík, Z. Ágh and M. Majerčák. The people as well as their material were then transported by long-distance buses as far as the south of the country, into the settlement of San Francisco de Yuruaní. Here we rented a jeep as well as four Indian porters – Pemons. Together we transported up al needed material (about only 200 kg! for approximately 10 days of stay on tepuy) through savannah and primeval rain forest under the foot of the Roraima mountain up to its apex plateau. The back-packs weighted 20–25 kg in average. The transport logistics was very effective and we reached the bivouac El Hotel Guácharos, where we set a base camp only in four days from Vienna! Even though we had to solve different tiny problems during the voyage such as the constant negotiation with our porters, a national park admittance in its administration in Parai-tepuy settlement or a terrible downpour during our ascent through forest up to Roraima. After up in the plateau we started a speleological exploration. We acted here eight days only as a whole and during the time here, as a small but powerful and quality team, we explored totally 16 caves and shaft joints in length of more than 3 km, from among which the Cueva Ojos de Cristal very represents the greatest system. Our research was incidentally aborted with coming one of our Pemón guides who had brought a message from an Inparques (national park) officer having asked us to descend Roraima down immediately because of our too long stay there without a permission. However, we would not probably stay on the meseta two or three days more because we have gradually given out a cooker fuel supply. A transport back ran without any problems then. The part of a group came back home from pueblo of Santa Elena de Uairén. We arrived home on January the 21st (the whole expedition lasted less than 3 weeks then). The another two persons continued their voyage after Venezuela nature attractions. The total costs of the expedition concerning its effect were very low, not exceeding 7 500 USD. Considering the situation of our bivouac near south-western edge of Roraima we engaged in research on searching for genetical and hydrological connections as regards the longest the Cueva Ojos de Cristal mainly in surroundings of the bivouac. As to the surface, during our stay we better recognoscated just about 0.5 km2 of the table mountain area, what is less than 1.5% of its area. For all that we confronted the standard difficulties in a local rough alpine nature, such as frequent fogs, enclosed country, deep disruptions or total lack of trees (we had to cook on cookers only). We were anxious to stop away from absolute loosing ourselves in a strange terrain by walking in two there. Nevertheless, we didn’t avoid loosing our way sometimes or to be late to our camp. It quickly gets dark here so it may be dangerous then. Whole our stay at Roraima we were fit regarding our health state. We tried to boil a water over or to modify it with special tablets. Provisions were brought here from home almost in a whole content. We have been vaccinated and we also used antimalarical tablets. During the stay nobody suffered any injury in the accident except for tiny scratches or sunburns. Having had the walks we sometimes got to the marshes or mosses here, but they are usually not too deep. The cave exploration has been done in a basic expeditional pattern. We used a standard equipment, lighten overalls for tropics, gum boots, gloves and a single rope technique. The Cueva Ojos de Cristal was mapped with a help of toposet Vulcain and drawn at great length of enlarged scale 1:500. Though the other caves were mapped just informatively, it is enough for now. Some important surface forms were localised with a help of GPS set. The photodocumentation of high quality from caves was made as well as the short film document about the Roraima nature. The longest cave explored by us is Cueva Ojos de Cristal cave system, which is long 2 410 m for the time being. As we mentioned above its entrance and entrance parts had been discovered by two of us during the action in February 2002. We continued in a detailed exploration in a presence. The cave has a character of classical, comparatively great corridors being a very unconventional event for such rocks as quartzites are. Literally we felt as we were in a limestone area somewhere... Until now, just deep, near bottom by water modelated fissures which collapse later and then form huge megadepressions (e.g. Sima Aonda, Sarisariñama) were known in quartzites. The cave discovered and explored by us belongs to the completely different, very unusual and until now not known phenomena, as to quartzites. The relatively low, obscure entrance is situated near Roraima peripheral edge enough, where there is some semiclosed ponor depression – rocky fold, where water enters into the cave. The cave itself is markedly subhorizontal with a height gradient of 24 m in a 400 m long main traction (whole height difference is 28 m). That is because of subhorizontality of sandstone sediments; cave spaces are developed then exclusively in discontinuities of bedding planes in this case. Also for that reason the corridors are very wide relatively, in some places up to 20–25 m! A height is disproportionally to it lower, 0.8–2 m in average. However, in some places the huge hall-like chambers with a height of 8–10 m are developed. The height gradient in a cave is got over very steplessly though in entrance parts the steps of several meters height occure there. The bottom of the cave is flat, stony, back and forth the whirlpool holes filled with aesthetic cobbles of 0.3–1 cm fraction develop in there. Some parts with little lakes and pools are filled with sediments of fine sand (originally from walls). In some corridors the rocky dissepiments and bridges occure. Cross sections of corridors mention generally vertical walls as well as a flat, nearly straight roof with a minimal gravitation debris. By the effect of undercutting the lateral walls, mainly their sides collapse. Thus the big plates with an area of the tenths square meters scale off or the goafs of great blocks with sharp parting originate. However, in the environment of an active water flow they are rapidly disintegrated by the effect of corrosion and then downwashed on in a sand fraction. The cave has several entrances mostly low and vestured by a tropical vegeta­tion. Two of them are the deep fissures indeed. They were given an operative genetic name „Pokemon“. These are not the classical Roraima’s fissures. They outright result in developing the cave passages! Their function as regards the connection with caves or their age are unclear, however, they probably absorb an energy of the cave-forming water, which falls down along the fissure deeply to the underground. They can be considered as the retentive-like, balancing basin, which is able to retain a considerable mass of torrent water of the cave waterflow. The further logical continuance of the caves, just ought to be cut, does not exist (!) or it is imperfectly developed. We found several such fissures (Pokemons), which could lead to extensive caves. Through the Cueva Ojos de Cristal a ponor waterflow with capacity of 1–2 litres per second is flowing, but in the dry season it almost dries up. In the case of heavy rains its capacity multiplies (maybe up to several tenths of litres per second; such events were not observed by ourselves). In the lowest corridors there the lakes originate and eventually can disable a movement in the cave. It must be kept in mind during an unstable weather when an explorer can be cut off in underground by the torrent waters for a longer time. The intensive draughts blow in the cave. According to them we usually knew if the continuance is evident or it is blind. The temperature we measured in the cave was 17 °C. It is almost the identical temperature as in caves around Sima Aonda in Auyan-tepuy, though Roraima’s caves are situated nearly 1 000 m higher. Maybe it is connected with their shallow-levelled situation under the surface of the plateau. The cave corridors are spacious, but also minor, labyrinth as well as creeping. They are usually filled with an orange fine sand, which can be eventually covered on the surface with something like crust, cracking during the movement in the cave. Complexity of corridors connection make the orientation there to be complicated. Some of the connectors are also huge, even without any relation to any well-known tributary. As if they were developed somewhere in a depth of rock in a process of its gradual watering. However, the greatest corridors of the cave are the active tributaries (Mischel, Sirénka) or their higher inactivated levels. These are gradually concentrated into the one main lead-in. We do not know what is its character like deeper in Roraima’s inland, in the area behind Pokemon. However, the dowse proved that the lead-in underruns from the end of the Cueva Ojos de Cristal several hundreds of meters to the north-western direction yet, even with the localised „tributary“ anomalies. It is in a good accord with the fact, that the cave runs shallow under the surface, parallely with it in the depth of 20–30 m only. This problem can be solved by the another research. In the Cueva Ojos de Cristal there occur very interesting speleothems. Their occurrence is just singular, they form aggregations of lance stalactites of dark-‑brown or black colour and a globular surface. These are up to 0.5 m long (mainly 0.2–0.3 m) and usually inclined to the opposite direction towards dominant draughts, the most frequently in the reduced corridor profiles, eventually above water yet. Their origin can be connected with moist aerosols blowing in the cave then. In this sense we can appreciate also their composition. They can crystallize from the nitrates (releasing from the bird guano decomposition in entrances or the decaying vegetation) as well as they can be standard iron minerals. The superincumbent beds of the dripstones are usually without discontinuities. Their hem is created almost always by some white-yellow crystalline films, thicker and thin as well. In an immediate surroundings there are also white, twist-like threads or minerals resembling to lichens on the wall. In one part of the cave we also found speleothems with a biologically conditioned growth. Deep inside corridors, already in the aphotic zone, there are the nests of some tiny birds (of Zonotrichia genus? ), which touch the roofs of the low corridors with their wings and backs during their flight. Thus the thick layer of fluff deposits. This also molds and it covers a continuous area of several square meters in some places. Aerosols blowing into the cave moisturise this organic matter on, mortar it together and thus the roof crusts or microdripstones are formed. We did not meet a similar type of the biologically originated dripstones anywhere for the time being. In one corridor there probably can be a high NH4 concentration because of constantly attacked bird dropping by a moisture. This creates the thick layers covered with grey-green crusts. This atmosphere does sensitively affect the human mucous membranes (eyes, nose and breathing problems). Therefore we did not stay there too long. In the cave we registered a rich cave fauna as to the abundance and the species diversity (mainly giant locusts, spiders and millepedes). The Cueva Ojos de Cristal is still not explored entirely. Mainly in the labyrinth parallel passages which are not explored very well the possibilities can be found. Though, this will expand cave’s volume just a little. A cardinal importance consists in looking for a continuance of the cave deep into massif, behind Pokemon. Roraima is exceedingly exemplary developed table mountain (tepuy), one of another 50 massifs of the Canaima National Park, one of the greatest in the world. It is of highly above savannah exposed narrow bench shape. It is long a bit more than 10 km and in south it is wide up to 5 km in maximum. The area is approximately 40 km2 and the shape is characteristic as for other tepuy: from a wreath of surrounding rain forest under, it is separated by vertical cliffs of height from 300 up to 500 m. At the apex there is a rocky, minimally planted plateau, which is divided just by local depressions, microcanyons, fissures or rocky labyrinths. The meseta is geologically almost explicitly composed of very pure siliceous sandstones of Matauí formation with volume of up to 98 % of siliceous grains. These sandstones are subhorizontal or just minimally inclined (generally to the north), massive, layered often with diagonal bedding. The plateau hydrology is partly subterranean, the weaker surface waterflows occure partially here and during rains they fall down through plain edge in waterfalls. The highest point is ground elevation at 2 810 m above sea level. The usual height of the plateau platform oscillates between 2 600 and 2 700 m above sea level. The state borders of three countries – Venezuela, Brazil and Guayana meet here (so-called Zona en Reclamación). The flora of Roraima is very rich and diverse as to the species. The numerous endemits grow here, for example fly-eating carnivorous plants of genus Heliamphora, rose-shaped Orectanthe or grassy Stegolepis which may be eaten. Many other, less outstanding, mainly marshy-ground species are numerous too. In marshes, respectively mosses, the thick beds of turf with so-called consortia of multiple plant species are created as well as algae vestures. Meanwhile, rocks are covered with organisms of Cyanobacteria group. The fauna is not less interesting. For example, the endemically species of a tiny, black toad Oreophrynella quelchii lives here. We ourselves had the beast of prey of genus Nasua from family Procyonidae in our camp almost each day. Little, sparrow-like birds of genus Zonotrichia were flying around. In caves there is a specific fauna then. The climate in Roraima can be very rough, with rains, fogs and low temperatures at night decreasing down to zero as it is rumoured. We ourselves enjoyed a perfect, sometimes sunny weather resulting in a trouble-free research, without any incidents with water torrent, especially in caves. We consider the climate to be of alpine type, brisk, but as a whole fresh and enjoyable. No sticky biting insects occure here, whereas which the savannah and rain forest down there are exceedingly abound with (puri-puri little fly-like biting insects and mosquitoes). It is recommended to enter the area in a season from December to February when it is a relatively more dry seasonal period there. Roraima is touristically largely visited. It is supposed, that each month approximately 200 people, from that 80 % of foreigners, ascend up there. A trip uphill means minimally five-day action and overcoming heavy rise of around 1 500 m. No special permission is required here, just to be replied at a national park administration officer in Parai-tepuy settlement and to pay for porters. A special research permission is given by the administration of Inparques in Caracas. Mountaineering, collection of natural artefacts and superbly developed siliceous crystals is prohibited. Also for that reason we did not collect any natural artefacts samples.